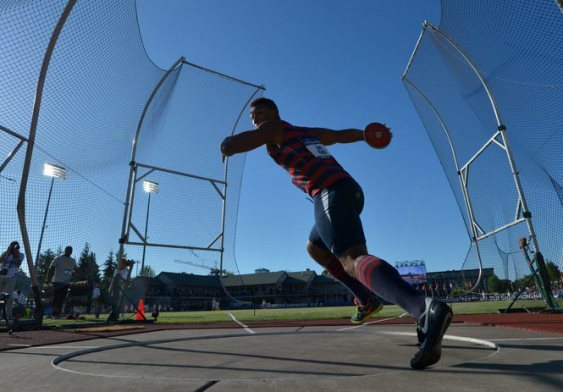 Penn senior Sam Mattis started the discus final with the goal to defend his NCAA title. He had a rough start – he fouled on his first throw, threw 190-03 on his second attempt, and then fouled on his final attempt. This put him in seventh place, good enough to get another three attempts to defend his title. He improved his mark on the fourth throw – 199-05 – moving him up into third place. He improved again on his fifth throw – 200-00 – to move into second place, one foot behind the leader Nicholas Perry of Nebraska. But on his last throw, Mattis fouled once again and would have to settle with a runner-up finish in his final collegiate competition as Perry was crowned the champion – 201-00 to Mattis’ 200-00. Cornell junior Bobby Plummer competed in his first NCAA triple jump championship, finishing 21st overall in the event. His best jump came on his final attempt – 49-09 ¼. He would have needed to jump better than 52-00 ¾ in order to get another three attempts. On the track, the men’s 1,500m final was actually contested at an honest pace for once as the pace went out quickly (41.9 for the first 300m; about 56.0 for the first 400m). Yale junior James Randon was a few steps behind the leaders during this first lap as he sat in fifth place, but fell back to over the course of the next 400m. Soon, he was battling for the eighth position – the final place to earn First-Team All-American honors. He was in ninth at the bell, but with the power of a 60.2 final lap, Randon was able to secure eighth place and First-Team honors with a time of 3:43.84. In our final HepsNation action in the men’s competition, Penn’s Thomas Awad got stuck in the middle of the pack at the start of the men’s 5km final. Due to the strong initial pace of around 66 to 67 seconds per lap, the entire 24 person field was spread out over a 2 second spread. Awad’s first 1km was in 2:44.73, around 1.5 seconds behind the leaders that are on about 13:35 pace. At the halfway point, the distance between the leaders and Awad increased to almost 3 seconds. At the 3km mark, Awad continued to drop back to 18th place as the distance increased to 6 seconds and Awad was losing contact with the main pack of 9 men. There was no way for Awad to catch up as he ultimately finished 22nd overall in 14:21.06 as Oregon’s Edward Cheserek won in 13:25.59. With the conclusion of the men’s championships, HepsNation earned five First-Team All-American honorees (Cornell’s Rudy Winkler and Rob Robbins; Princeton’s Adam Bragg; Randon, and Mattis). Cornell was the highest scoring team at the end of the meet, finishing in a tie for 26th with 9 points, followed by Penn in a tie for 29th place (8 points), while Princeton and Yale were included in a tie for 76th place with 1 point. The NCAA Championships wrap up tomorrow with the conclusion of the women’s competition. Ten women will be representing HepsNation – eight undergrads and two alumni – so there will be plenty of action to watch. All of the field events will be streamed online on ESPN3.com while all of the track events will be shown live on ESPN starting at 8:30pm ET. This entry was posted on Friday, June 10th, 2016 at 9:52 pm. It is filed under Athletes, Spotlight. You can follow any responses to this entry through the RSS 2.0 feed.